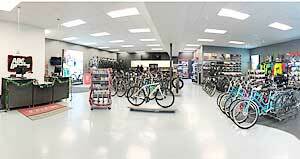 We believe that the fit and feel of the bicycle is the most important aspect of purchasing any bicycle. We have many customers that focus on components or color, which do matter. However, the three largest parts of the bicycle, the frame, fork, and wheels, are the key factors in creating a bicycle that will be stable, comfortable, and fun to ride. These are the three things that will separate any Trek or Gary Fisher bicycle from the competition. Traditional bike fitting approaches (tool kits, articles etc. ), are based on formulas and key measurements. These are "cookie-cutter" formulas that take every person and place them in a "position" that their body may, or may not, be able to adjust to. We believe that every person has a unique body build (mechanical, muscular, etc.). In order to address each rider individually, our Fit System addresses each person on an individual basis, taking into account their anatomy, flexibility, range of motion and riding style. We believe that the relationship between the rider and fit technician is imperative to a great riding experience. That is why our fittings are guaranteed for one full year. We know that body's change. And for better or worse, your bicycle should be able to react to these changes. We believe in the fit technician. We feel that if a fitter who's advertising places greater emphasis their 'system' or 'technology' or 'certifications' (often multiple) than their skills and experience should be reviewed with caution. We have prepared a page of information that you can print out, with details on fitting and what you need to bring to your fit session. A Bike Sizing will allow us to select the proper frame size for your body. The bike sizing will allow us to place the rider in a "developmental" starting position where they can try many different bicycles until they are confident in the size/or model. It must be stated that this sizing makes sure that you begin your experience on the correct frame size. The sizing does not take into account injury, flexibility, range of motion, or other asymmetrical challenges of the individual. All of these are considered in our Performance Bicycle Fit. The sizing simply makes sure that you get the correct size frame that will be able to adapt to your body after a Performance Bicycle Fit. Through three body measurements, we will be able to calculate a rough starting saddle height and correct frame size. These specific measurements will accurately determine a starting point in which to begin your cycling experience. It is strongly recommended that you make an appointment for a Performance Fit within the first six months. We believe that every person has a unique body build (mechanical, muscular, etc.). In order to address each rider individually, our Fitting addresses each person on an individual basis, taking into account their anatomy, flexibility, range of motion and riding style. A Performance Fit will ensure the best riding experience. It will make you more comfortable, allowing you to ride longer and/or faster pain free. By employing body alignment principles learned from physical therapy and yoga, the certified fit technician and rider will be able to distinguish specific limiters and preferences with regards to riding style. A complete, in-depth interview and body assessment are used to diagnose each person's flexibility level and body alignment to determine the most efficient and comfortable position on their bike. This fitting is guaranteed for one year. 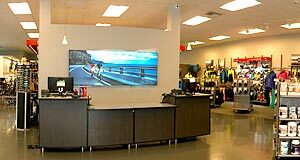 Our Fit Technicians are here for you regardless of where you purchased your bike. We believe in that we are here for you. There is no pre-disposed end result. We take each individual and address their needs on a one on one basis. 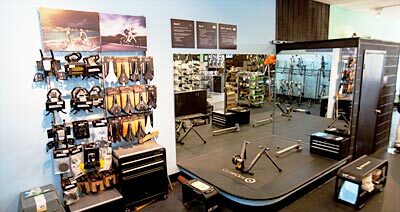 A bike fitting is the best investment you can make after your bicycle purchase. Rotational Adjustment Devices (R.A.D.s™) are ingenious devices recognized by cycling technicians, coaches, and podiatric professionals as the best and most reliable method for setting the cleat position on the cycling shoe, allowing for the rider's natural gait. Correct rotational alignment of the cleat is necessary for a secure and efficient pedaling. It also greatly reduces equipment induced injury and the potential for traumatic injury that can result from improper cleat alignment or pedal float. This service can only be performed if the rider has already been properly fit to his or her bicycle. Customer is responsible for all stem, handlebar, saddle, and seatpost changes as well as any labor charges to make the recommended modifications. The customer is not obligated to change anything. We are here to help. Fittings are guaranteed for one year from date of fitting. Cleat Alignment is guaranteed for 30 days. Some of the technology and branding out there is high profile and marketed well. If the fitter feels they need to rely on their school of training or brand of tooling more than their track record and abilities, you, the potential customer are likely walking into a poor experience. As an analogy, did anyone ever see a surgeon advertise the brand of scalpel they use? You are purchasing expertise, not tooling or branding and it is well to remember that if you want a good fitting experience. A quality bike fitter will use the tooling they prefer. It might be high tech; it might be low tech; it might be motion or video capture; it might be direct observation; it might be some or all of these things or something in between. What matters; all that matters, is the result.